Smile More – Smile Bigger –Smile Faster! You want to improve the look of your smile, but does the thought of spending months, or even years, in braces sound like too much of a hassle? With AcceleDent® Aura, you can now speed up your tooth movement by up to 50%! Using this pain-free, easy appliance, you'll achieve your most perfect smile in no time at all. AcceleDent Aura is a light, comfortable, and hands-free appliance that is used 20 minutes per day as a complement to orthodontics. The exclusive SoftPulse Technology's™ precisely-calibrated micropulses gently accelerate the movement of your teeth as they're guided by your orthodontics. With patented SoftPulse Technology, AcceleDent Aura's micropulses allow your teeth to move more quickly. The micropulses actually exert much less force (up to eight times less) than a power toothbrush! The best part of AcceleDent Aura is that it's safe as demonstrated in US clinical trials. AcceleDent has been prescribed to thousands of patients worldwide since its introduction in 2009. Cleared by the United States Food and Drug Administration, AcceleDent is only available by prescription from your orthodontist. The benefits of AcceleDent Aura will make you smile! You'll accelerate your orthodontic experience without sacrificing aesthetics. AcceleDent can be used for adolescents, teens, and adults, and it is completely safe for patients of all ages. 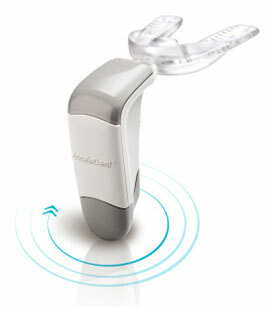 The AcceleDent appliance is lightweight and comfortable. You may even forget you're using it! The hands-free design allows you to achieve a beautiful, straight smile faster than you ever thought possible — even while reading, watching television, listening to music, or doing school work.